Discussion in 'Build Logs' started by Zgembo, May 20, 2017. It's been some time since I started this build... The leading idea behind the project was to make fully fan-less, yet fairly performant system, while trying to keep the size in check. With the recent power-efficient 65W TDP Ryzens this had finally become a reality. The main concern was the passive GPU cooling, as currently all the market offers are either super-pimped (read: ugly) intentionally factory-overclocked supersized cards, or very weak single slot SFF solutions. 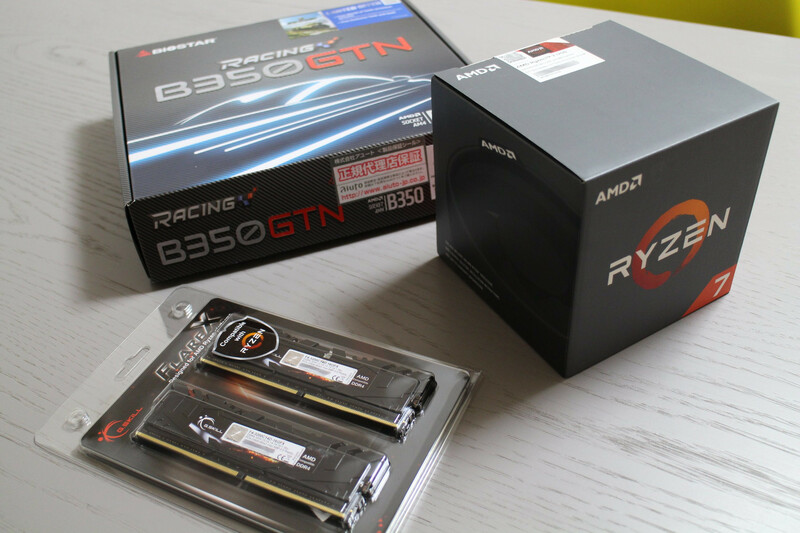 Luckily, there is a thriving video BIOS modding community around recent AMD cards, those being concerned about coin mining power efficiency, so it is fairly easy to learn how to mod the AMD card BIOSes so they could be under-volted and under-clocked to be cooled passively in a reasonable manner. 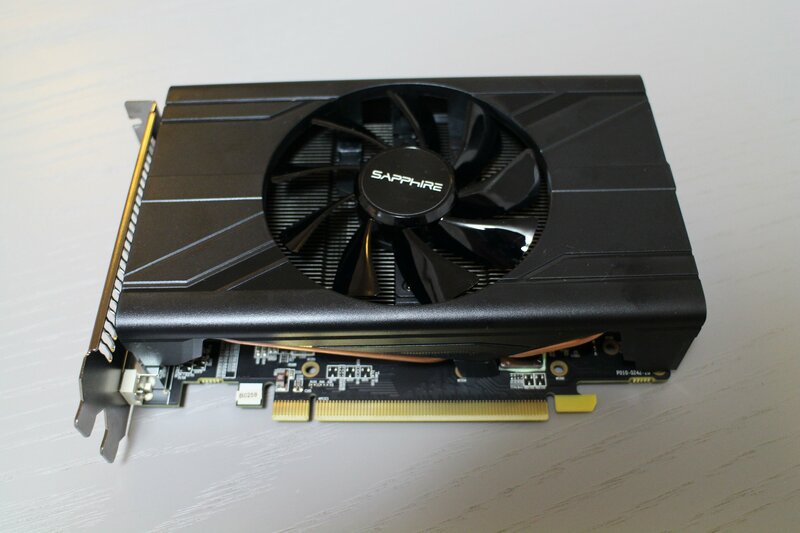 And ultimately, thanks to Sapphire, a card appeared on the market that can actually fit in a fairly small case. Obelisk, Lisao, Weredawg and 10 others like this. What an awesome build. I love the Streacom DB4, I'm amazed you're running that configuration in there. I can't wait to see how you manage the thermals. I'm curious, where does the PSU fit in this case? So, here is how I've built it, up to the point of having working CPU. Finally, started playing with it one weekend. Here is just the MB mounted on a Streacom MB tray. In order to use all four chassis heatsinks optimally, I had to go against the manual and try to pull half of the CPU heatpipes below the motherboard. This is due to the PCIe slot positioning which leaves only one option for the main GPU heatsink, the very same place where the long CPU heatsink is meant to be. To pull some of the pipes under the MB tray, I had to bend them slightly (well, at the end, slightly more than the image actually shows), so that they can go over MB components and yet fit below properly. 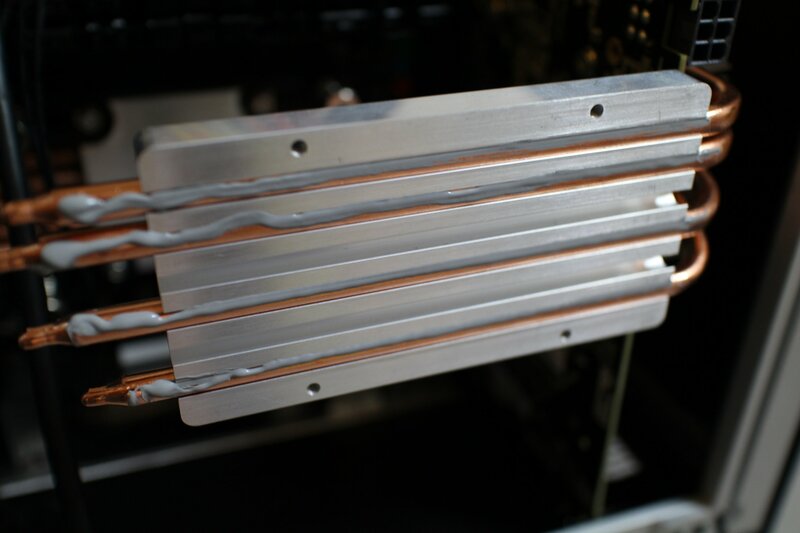 I've opted to use only the short aluminium sink pads (ones included in LH6) for cooling CPU, saving the long one (included with DB4) for the GPU, as it would probably generate more heat. 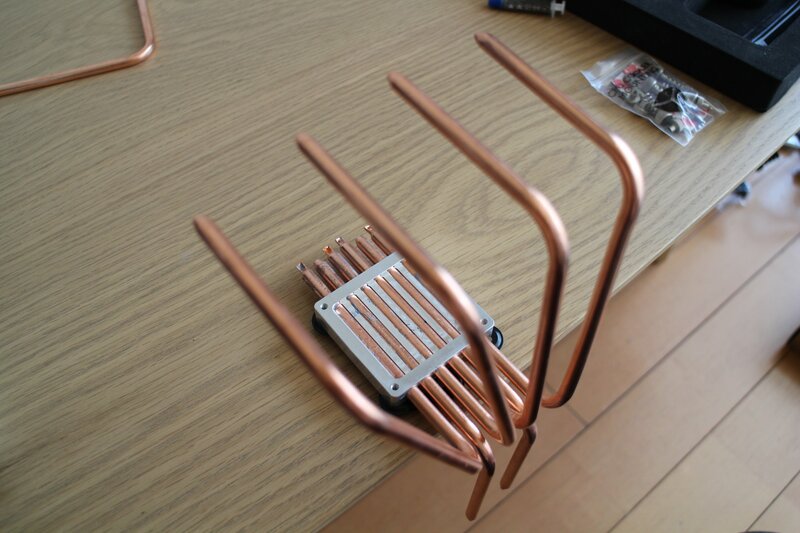 So, I've made the "heatpipe spider", one part of it leading pipes below the MB, and the other part sideways. It took some time to properly adjust the side pipes lenght, as this has to be done before the CPU screws are fully fixed, every millimetre counts! I've mounted this on CPU, but I had to replace the black CPU supporting pad found on the back of the MB with the small supporting bolts found in the DB4 set, because apparently the DB4 screws for fixing the CPU are of slightly different granulation. On my first attempt, this is how it ended up. This was accompanied with thermal pads included with DB4. So, what was wrong with this first attempt? Well, first set of CPU burning tests confirmed that the heat flow to the chassis body was not ideal. Someone on this forum suggested that thermal paste would work work better than the thermal pads, and I decided to try that. Also, on my second attempt, I've balanced the pipes better, with three of them going below the MB, and other three going sideways. 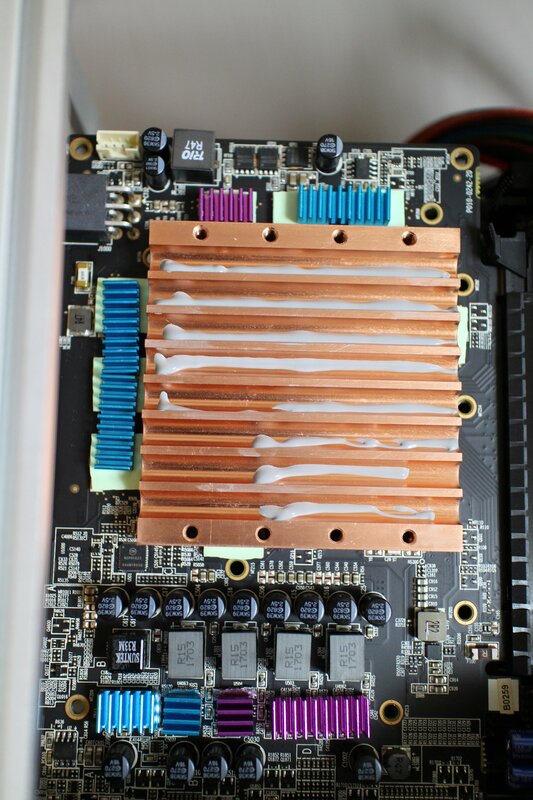 Applied healthy amount of thermal paste on the chassis facing end of the heat-pipes, and then carefully placed the side plates in place again (see the imgur gallery pictures with all the components in place). This had much better result on CPU cooling, yet still not ideal. It would take a full hour of AIDA64 CPU burn tests for CPU temperature to reach the throttling levels, and even at those levels the throttling was minimal, so I'd say its acceptable. Unfortunately, as of now, the Bisotar B350GTN UEFI BIOS does not provide any options to down-volt or down-clock the CPU, as that would bring the situation much closer to the ideal one. I certainly hope Biostar would support under-vloting and under-clocking in UEFI in the future. Biowarejak, Soul_Est, K888D and 3 others like this. 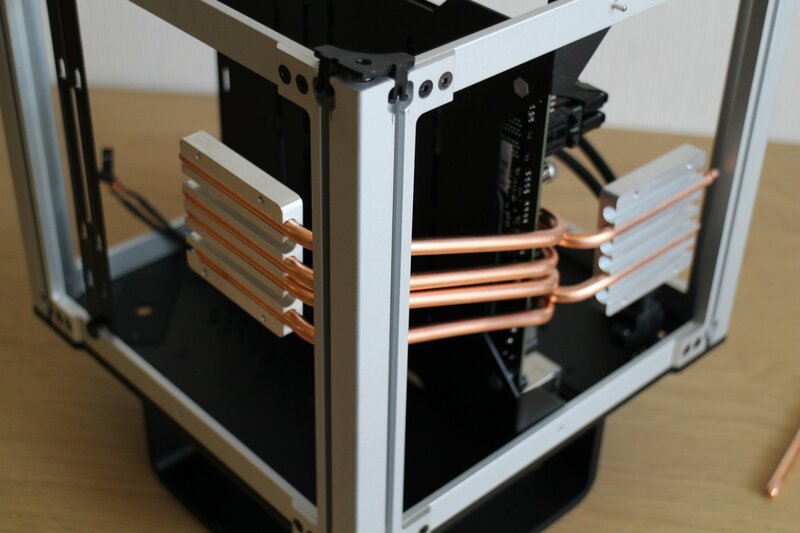 I would have guessed it would have been better if the aluminium heatpipe blocks had the flat side towards the sidepanel, but the manual indicates you mounted it correctly. 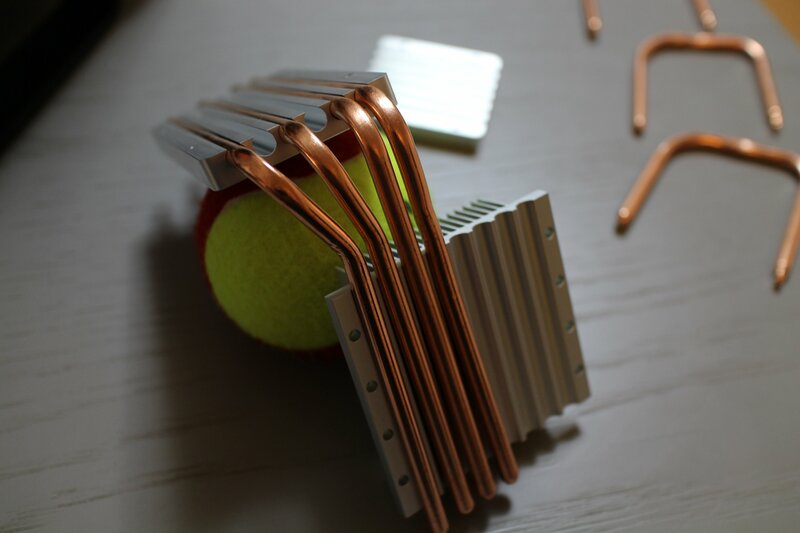 It would solve the problem of the limited contact area between the heatpipes and the sidepanel. But I'm not sure it will fit like that because the flat part of the block is about 2mm thicker. 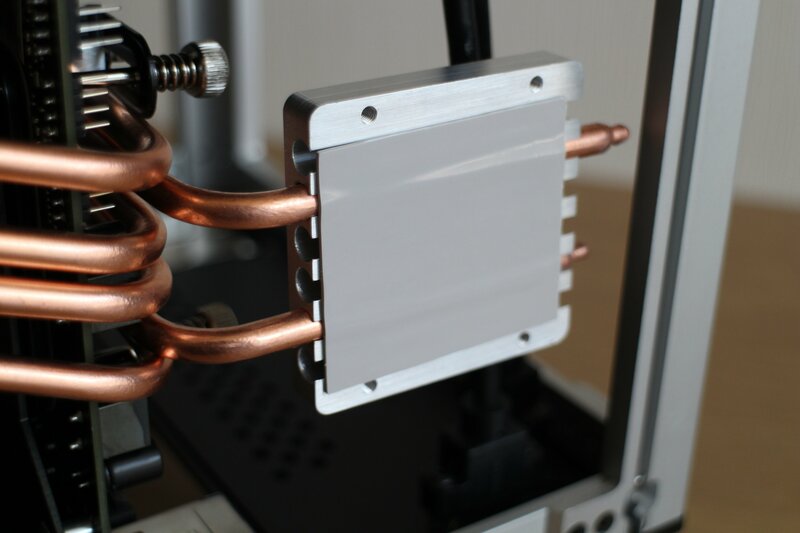 The inside of the block's channels would need to be coated in a thin layer of thermal paste to improve contact area with the heatpipes and again a thin layer on the flat side that goes against the panel. Though it might be worth a try if you have the time and curiousity. 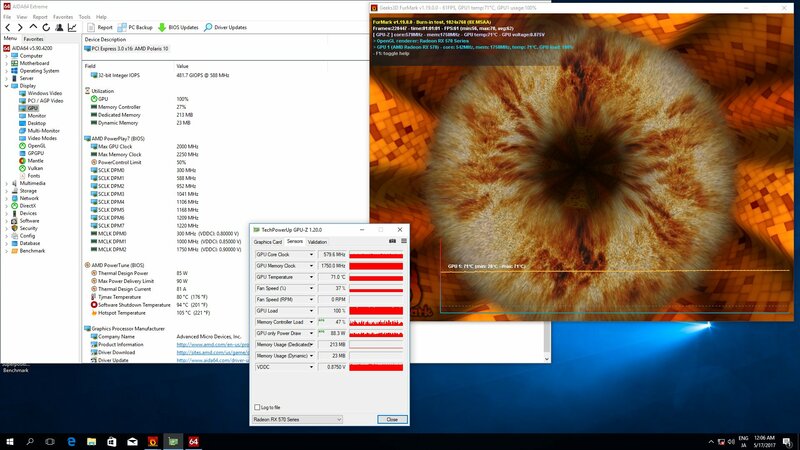 That's where you can see gap between amd tdp (65w amd=91w intel), but please don't use a cpu stress test within db4.. what about temperature in your standard day work? I did actually consider that, but that 2-3mm difference in block thickness would really make it difficult. 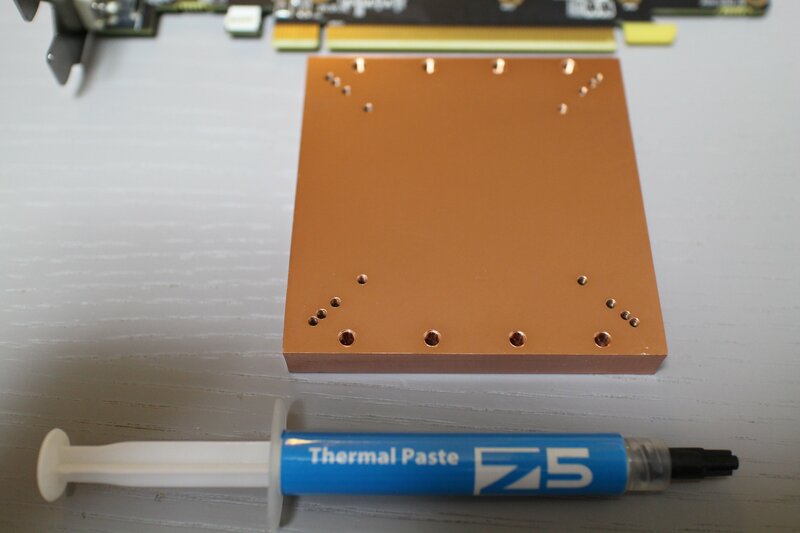 However, it seems that the heat conducting gets really good when the heat pipes are directly touching the chassis side sink panels, and good quality paste helps considerably. My fingertip "sensors" can feel the heat building up immediately on the outer side as soon I start the CPU burn tests. It wasn't the case with thermal pads. Regarding the idle temp, that is below ~40C (browsing net for hours, some music in the background), on an average late spring night in here (~22C). Better than acceptable. Did you stress the gpu yet? 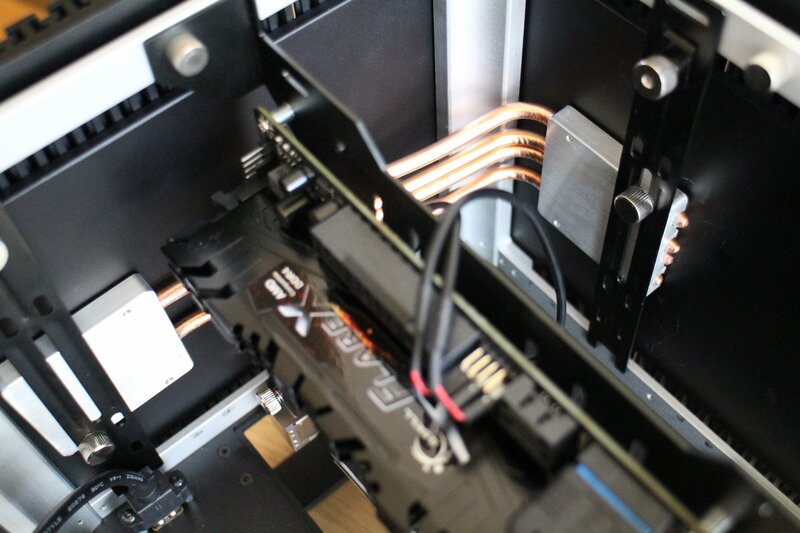 Btw, I used 2mm shims to push the heatpipes better against the panels, it's a tight fit but it works. So reversing the alu blocks should work too. Zgembo and Phuncz like this. Looking through a few builds with this case I think the main issue is getting the heat to spread through the plate. The contact point heats up but is slow to dissipate. Perhaps having more alu plates and spreading them across a larger area would help? 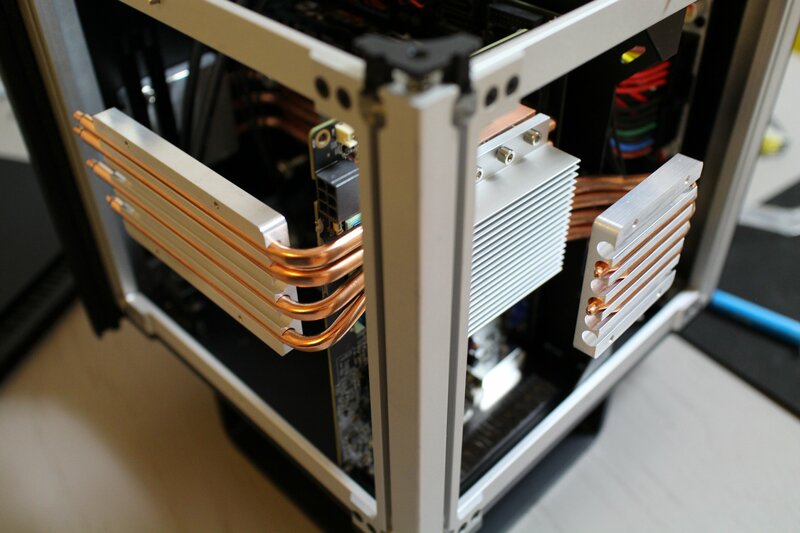 I do love fanless cases. You can get good contact with a bit of fiddling, aluminium is not that bad of a conductor so the heat will spread trough the panel. But since it can only dissipate an x amount heat will build up. Can you post some Watt numbers on how low can you go with the CPU (in respect to 65W) & GPU (150W)? This case is gorgeous! I wonder if you can make those contact plates a little larger via some modding or additional aluminum to help spread the heat out and potentially dissipate it quicker. 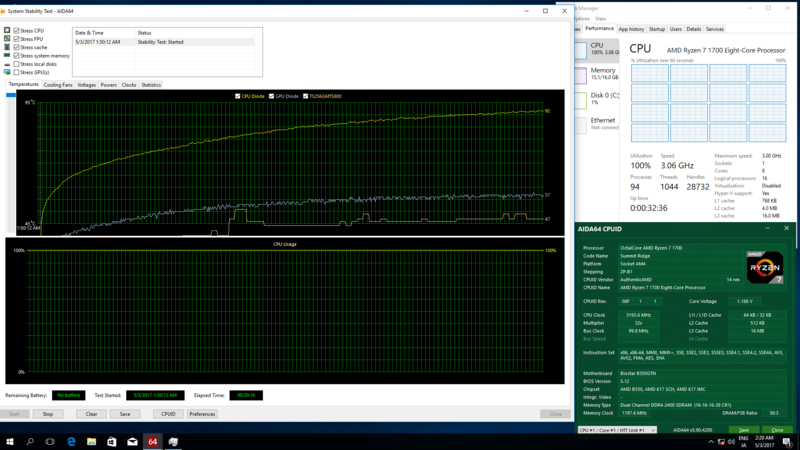 It's unfortunate you can't reduce voltage in the Bios, but have you tried to reduce the max CPU power in Windows? Very true, ryzen master should be the software for you.. Please make sure your ryzen 7 1700 never exceed 70°c, that's the threshold where throttling is appearing. Hi, my build is up and running. Looks like my implementation was a bit overkill for the gtx1050ti I used, temps max out @ 48C (long idle 30C) with an ambient of ~24C. Very curious about your gpu results, have plans to try it with a vega once they are out. Zgembo and TinyAudio like this. I saw that article and find it to be, well, misleading. I did my homework well, and according to the evidence I have collected (graphs of CPU master clock, core clocks, CPU power usage...), the throttling starts to happen only at 95C, when BIOS overclocking settings are at its factory defaults. This is Ryzen 1700 (not the X version), so there should be no 20C tCTL offset or any such BS involved. The temps and power usage sensor values are in line of what my fingertip "sensors" are sensing as well as what is my external (AC) power meter is telling me. ...a continuation of a build log. Before I even consider which graphics card to use for this build, I got miself the one and only GPU heatsink solution, an excellent HDPlex H5 GPU set. This thing deserves a build log or review of its own, but I'll just focus on how I paired it with Sapphire card & Streacom DB4 case. This heavy copper pad, and trust me, this sole piece seems heavier than the whole Sapphire card stock cooling solution put together, comes riddled with quite flexible set of holes. It also comes included with relatively flexible (and that comes important later on) heat-pipes as well as solid quality thermal paste. Luckily, the copper pad holes were of good match, it fits pretty well. 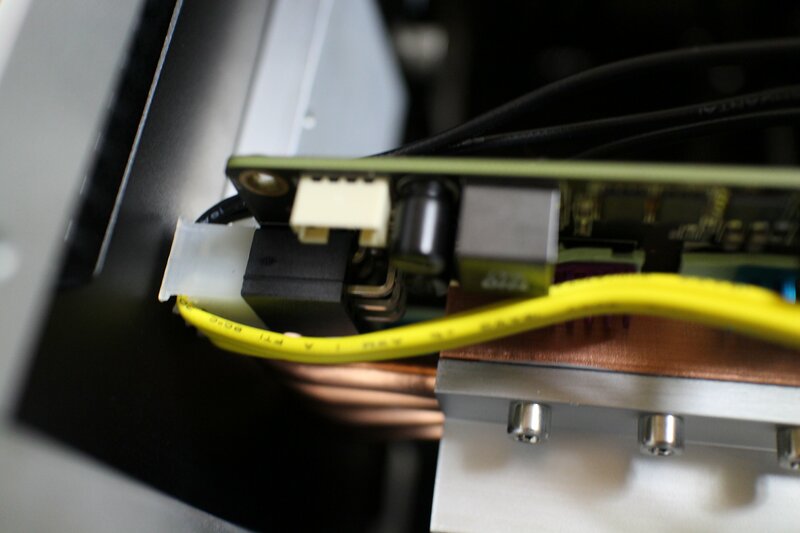 With the copper pad on, the part of the card around GPU die become so heavy, that it felt like the PCB would crack if the card was not held in a correct manner. 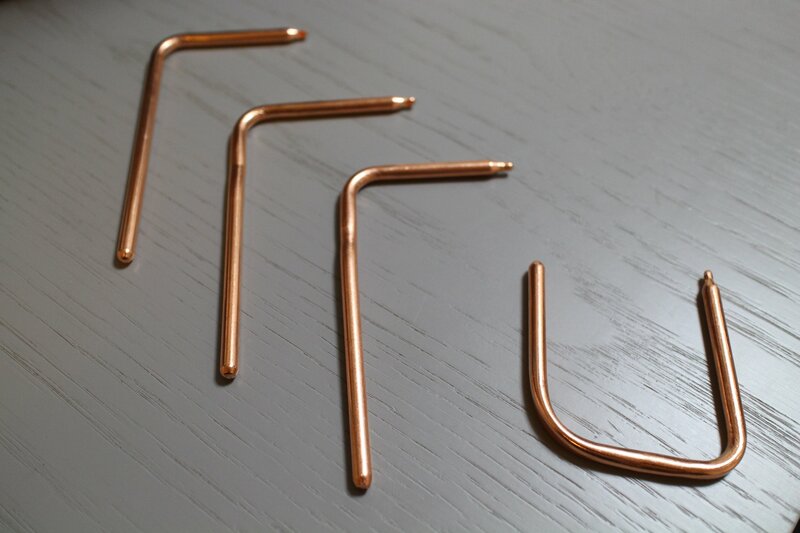 Also, the screws for tightening the copper to the PCB are somewhat short, so the process of attaching it to the PCB brings in the risk of damaging the GPU die or PCB. Where goes the risk, so does the thrill, but be warned when attempting such endeavours by yourself, patience is essential... Unfortunately, the copper pad does not cover the 6 out of 8 DDR5 ICs in an optimal manner, it touches approximately 20% of the surface of those thermal pads. Since the Sapphire Mini was the last component that I got, I added it to the rest of the system after setting up the CPU cooling solution. 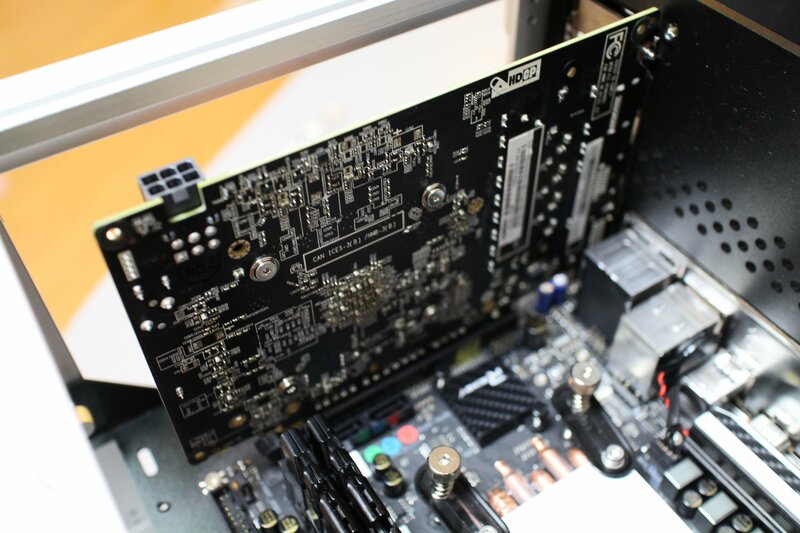 The card PCB format is perhaps a bit too tall for smaller Mini ITX cases, as it goes 11mm above the upper edge of PCIe slot metal bracket, and is impossible to be placed in DB4 once the motherboard is fixed inside. Fortunately, DB4 proved very versatile, its whole bottom cover, together with horizontal piece of an aluminium frame can easily be removed with a proper hexagon driver (of a smaller size than the one included). But what with that PCIe power connector? Expectedly, due to the card PCB height, normal connector would just not fit in. 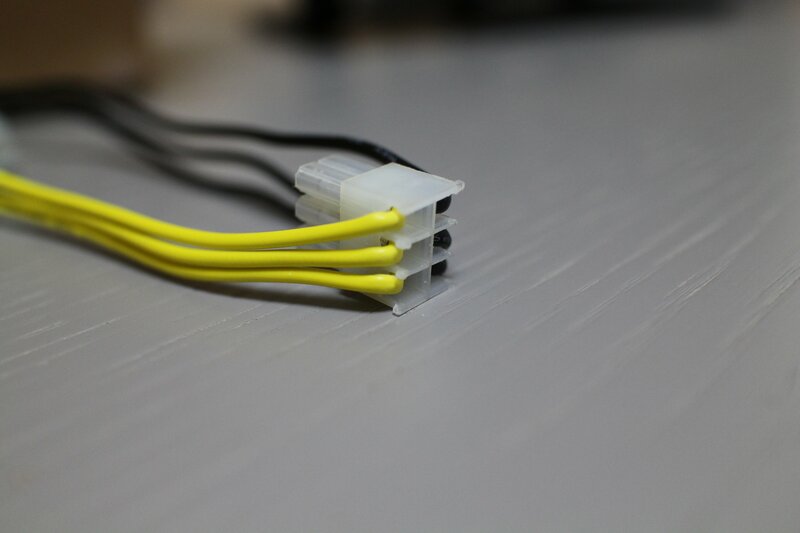 Hence, I had to make this hackjob connector from some cheap 12V PCIe 6-pin extension cable, in a way that the wires are sticking out sideways from it. Apparently, ready made L-profile PCIe power cables are available for purchase at some places, but not in here. Smooth job so far, ha? Time for some real challenge, the pipe-work. 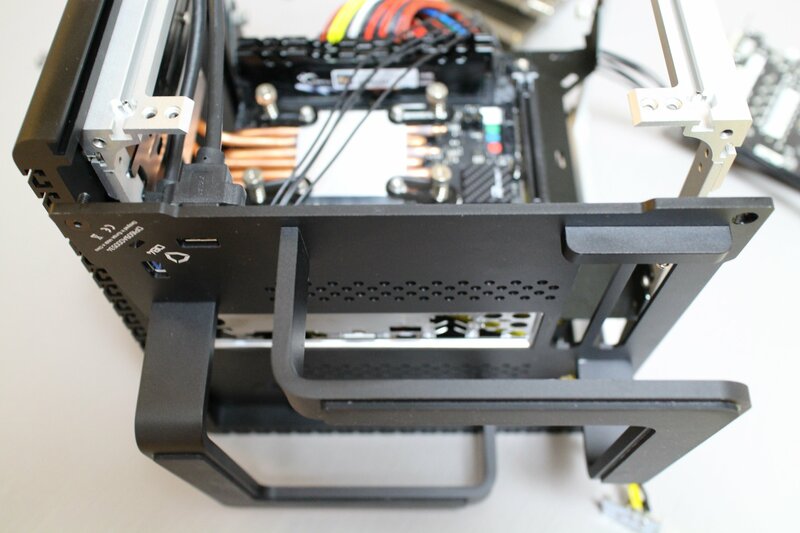 Since the heat-pipes included with HDPlex were never meant to be used in anything else than HDPlex H5 case, they would need to be shaped into obedience towards Streacom DB4. 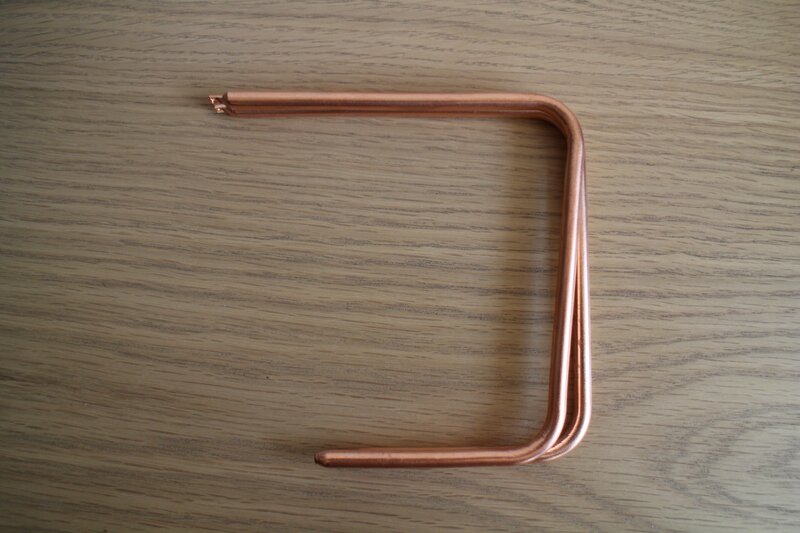 First, the dull angled bends on the four shorter pipes had to be straightened, and then then bent into an U shape. Bending heat-pipes by bare hands is never going to produce a perfect result, but armed with patience and some improvised helping tools (a wheel from an old cabinet) a satisfactory result was achieved. The pipes included with HDPlex GPU set are of softer type, they bend relatively easy, meaning its also easy to screw them up in the process. For the remaining four longer pipes, just one of them had to be straightened, so the result of that half of a pipe-work looks much cleaner. ...the copper pipe monster ended up attached to the poor Sapphire Mini. 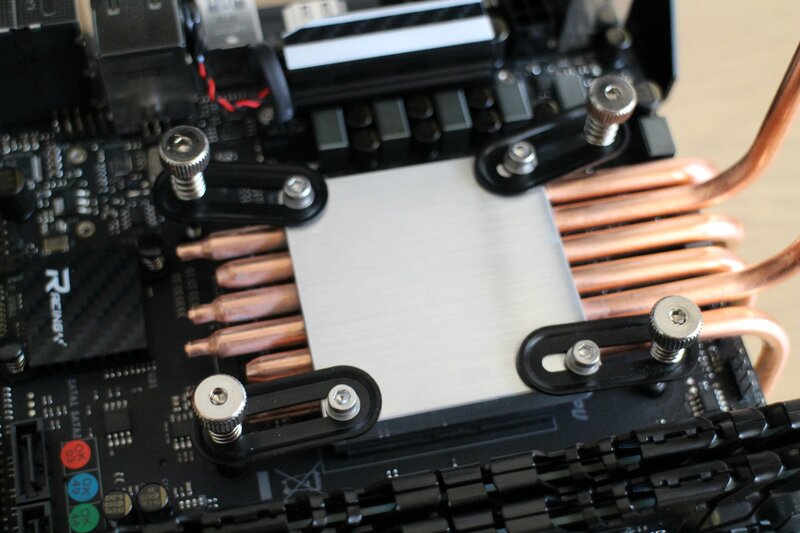 At this point an aluminium sink from HDPlex GPU set was intentionally left somewhat loose, so that the Streacom aluminium pads & attached heat pipes can be precisely adjusted in order to have heat pipes touching the chassis aluminium side plates in an optimal manner. After finding the optimal position & tightening the sink to the card, the time had come to grease up the side of the pipes meant to dissipate the heat to the chassis. When the chassis plates got back in place, the shorter set of pipes fit in pretty tight, putting some pressure on the card itself, but the the longer set of pipes provided some resistance to withstand that pressure. Not optimal, but acceptable, provided that the chassis plates are mounted back in a correct order. OK, so we have the card in place, heat-sink set mounted, chassis tightly closed, but what's with that PCIe power connector? It turned out it barely fits in, could be accessed only when the chassis plate on its side is removed, and there is just about 1mm of space between the connector plastic cap and the chassis plate. After all the torture done to the Sapphire Mini, I was pleasantly surprised that it actually worked. This being my first attempt to cool a GPU passively, I've baked a very power-conservative custom VBIOS for the card, one limiting the GPU power usage to just 85W (vs default 120W), just for the initial round of burn tests. After an hour of Furmark, GPU temp barely reached 71C. The heat dissipates to the chassis pretty fast, and it does spread well over the aluminium plate surface. The plate attached to the longer set of pipes is expectedly more efficient, it gets warmer a bit quicker than the plate attached to the shorter set, but the other one catches up soon enough. That's it for now. In the meantime I'll spend some more time searching for VBIOS mod efficiency sweet spot for this build. I don't expect the GPU to be able to go even close to its default 120W GPU (plus an overhead for DDR5 and the rest of the logic), but I'd be happy if I could squeeze 75% of its nominal performance for this build... (an advanced advices on how to optimize VBIOS are more than welcome). SeñorDonut, TinyAudio, Raiju and 1 other person like this. Oh wow, impressive result on the GPU, didn't expect it to work so well ! 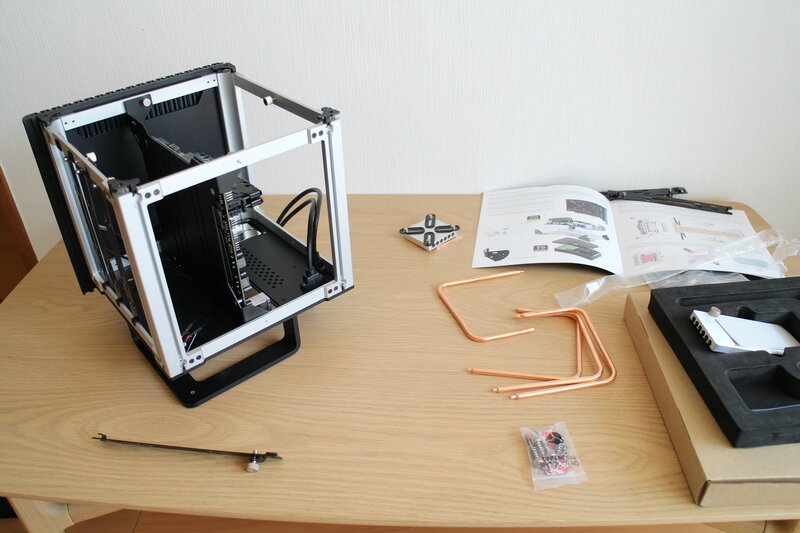 I'm guessing stressing both CPU and GPU will heat-soak the outside of the case pretty quickly though.